The 16 members of of the 2018-2019 Let’s Move in Libraries Advisory Board work in public libraries in Alberta, California, Georgia, Iowa, Kansas, Kentucky, Maine, Maryland, New Brunswick, North Carolina, Ohio, and Utah. We work in small towns and big cities. We include presidents of state library associations and recent grads of MLIS programs. We include librarians with certifications in Yoga, Zumba, and Personal Training, as well as Early Literacy experts who know who to get kids moving from a young age. We are Gardeners, CrossFitters, Roller Derby Players, Runners, Bicyclists, Hikers, and Walkers. Did you miss the call to join us in 2018-2019? An invitation will go out in Spring 2019 to join us for 2019-2020. Sign up to make sure you don’t miss out! 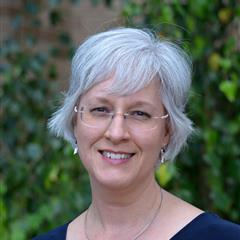 Heidi Beke-Harrigan is a yoga teacher, medical communicator and health sciences librarian. 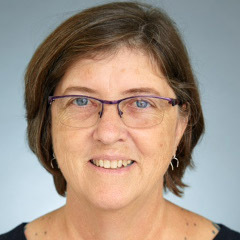 At OhioNET, she coordinates, promotes and co-develops continuing education opportunities and member services that support librarians in their work. In her role as a yoga and yoga nidra teacher, Heidi strives to make movement and self-care accessible to everyone. She also co-facilitates the Day of Mindful Living, a program at River’s Edge in Cleveland that introduces law enforcement to mindfulness practices. 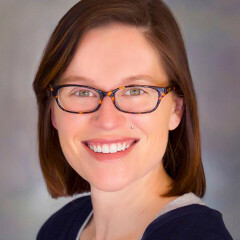 Jenn Carson is a professional yoga teacher and the director of the L.P. Fisher Public Library in Woodstock, New Brunswick, Canada. She is the creator of the website yogainthelibrary.com and has been delivering movement-based programs in schools, libraries, and museums for a decade. She also blogs about her physical literacy adventures at the ALA’s Programming Librarian website: programminglibrarian.org. Her book on physical literacy is now available from ALA Editions. 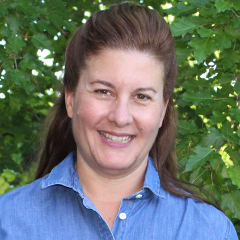 Danielle Fortin began working in libraries in 1996, and she is a Teen & Adult Services Technician in Lewiston, Maine. Despite playing softball when younger, Danielle wasn’t very active after high school. Nothing interested her — except Roller Derby. 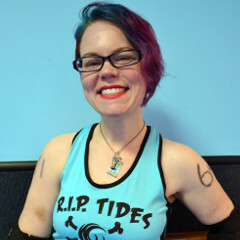 That dream seemed unattainable until she passed tryouts for Maine Roller Derby in 2016. Joining MRD has made an incredible impact. She now cross-trains, eats healthier, is kinder to herself and believes in her abilities. 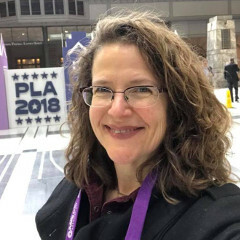 Lisa Hartzell is the Youth Services Librarian for the Haywood County Public Library in North Carolina, where she has worked for the past 25 years. At Haywood, she developed Rompin’ Stompin’ Storytime, a music and movement program. She is a 2015 graduate of the MLIS program at UNC-Greensboro. She is married and has 4 sons, all grown ranging in age from 20 to 29. She lives in the beautiful mountains of Western North Carolina not far from where she was raised. 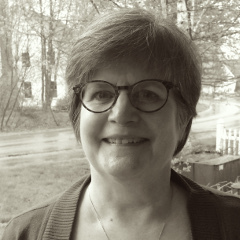 Andi Jackson-Darling is the Director of the Falmouth Memorial Library in Maine. She Received her MLIS from the University of South Carolina and BA from the University of Southern Maine in Media Studies/Creative Writing. She practice yogas, chases grandchildren and walks her two labs for exercise. She feels moving our bodies is key to not only a healthy body, but good mental health as well. She is a past president (2011-2013) of the Maine Library Association. Catherine Jellison is an Early Literacy Specialist at the Crofton Branch of the Anne Arundel County Public Library in Maryland, where she provides storytimes for children under 5, sensory storytime, family music and movement programs, and downloadable content/mobile device training for all ages. In her free time she loves to cook, run and hike with her dog, and putter around the garden. 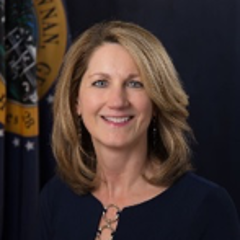 Amy Mapel has over 21 years of experience in public libraries (and a 1 ½ year stint in a private school library). Currently she is the director of the Carnegie Library in Newnan, Georgia, where she has worked since it’s re-opening in 2009. The library offers several movement programs including Exercise is Medicine, Gentle Yoga, and very active Story Times. Amy is enthusiastic about fitness herself and enjoys Jazzercise, yoga and bike rides with her family. 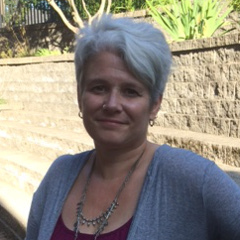 Cosette Ratliff is a Supervising Librarian with the Alameda Free Library in California. She has a varied background of military (USAF), the Peace Corps (Marshall Is. 85-88), and 911 Dispatch. She earned her MLIS at San Jose State University and worked at the Dallas Public Library before coming to Alameda. Cosette’s passionate about helping others explore the outdoors, and developed the Libraries Outside program to help provide access to information and supplies for the community. 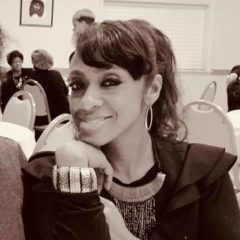 Michelle Bennett-Copeland has worked in the Atlanta-Fulton Public Library System for 16 years, and loves what she does. As a Branch Manager, she received a Community Champion Award, from Adamsville-Collier Heights Business District, for excellent community engagement. As a Youth Services Manager, she’s recognized for building partnerships with schools and other organizations. Michelle is also a dance instructor, and has been trained with various forms of dance. Michelle believes all types of physical exercise are as important as traditional literacy; it’s a need for all. Barbara Scott has been Children’s Librarian at Bucyrus Public Library in Ohio for 33 years. She is also Executive Director of Crawford Reads 20, a county-wide initiative. For the past 5 years, Barbara has written United Way grants for and co-taught a wildly successful Music, Movement, and More program at her library. Total attendance has reached over 8,000 folks! She has spoken on this program at Ohio Library Council chapter conferences and at an ALSC National Institute. 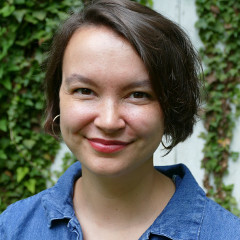 Staci Stanton has been Assistant Director at the Knoxville Public Library in Iowa for 9 years and she is currently enrolled in the MLIS program at San Jose State University. During this time, she has learned to appreciate the invaluable benefits of reducing stress and improving overall mental and physical health through running, and more recently, CrossFit. Her passion for health has inspired her to be a better advocate for others’ well-being. Betsy Sumerford is the Children’s Services Manager at May Memorial Library in Alamance County, North Carolina. She has been teaching yoga since 2012 and is excited to combine movement-based programming with library services (and to hear how others do so as well!). Chelsea Swinford is a Youth Services Associate at Boone County Public Library in Northern Kentucky. She’s currently attending SJSU for her MLIS. Chelsea hosts a storytime series called “Stories and Stretches” for preschoolers that incorporates elements of yoga and mindfulness, and she’s working on expanding her branch’s outdoor programming space to promote physical and environmental literacy. She lives with her husband, Nash, and their dog, Kramer (who always gets her moving). 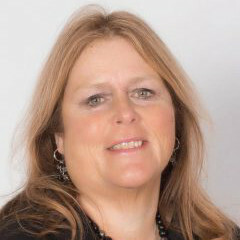 Lisa Weekes is Manager of Partnership and Community Development for Chinook Arch Regional Library System, which consists of 33 member libraries across southwest Alberta. Physical literacy and lifelong active living are personal and professional passions that guide her program and project development. She has worked in the public library world for over 10 years. On the personal side, Lisa enjoys family trips across Canada and beyond with her husband and two teen sons. 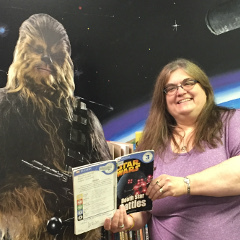 Heidi Whelan is Youth Services Librarian at Baxter Memorial Library in Gorham, Maine. 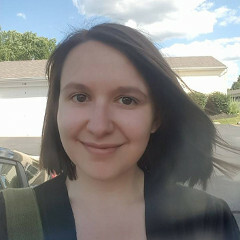 She has a Bachelor’s degree in LIS from the University of Maine at Augusta and is currently enrolled in the MLIS program at Kent State. She is an early literacy expert who works to keep current in the field. 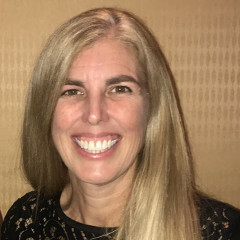 Her enthusiasm for mindfulness, body awareness, and physical movement led her to incorporate these philosophies into programming for children aged birth to eighteen. 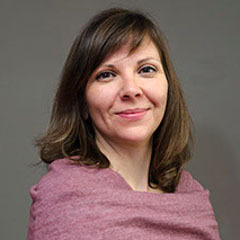 Anna Zanarini is a Senior Librarian in Early Learning Outreach and Programming with the Salt Lake County Library in Utah. She has nearly 25 years of experience working with children in libraries doing storytimes and other programs, usually adding a movement component to whatever she does. She is also a fitness instructor who began this second career in 2010 when she discovered the fun of Zumba and wanted to share it with everyone she met, especially children at the library.